Electricity Fee Can Be Calculated In Real Time Based On Customers' Actual Usage. By using a PWM valve to control the time ratio of unloading and loading status, the DC inverter scroll compressor can continuously regulate the capacity within a range of 10%–100%, increasing the precision of capacity regulation and the stability of indoor temperature. 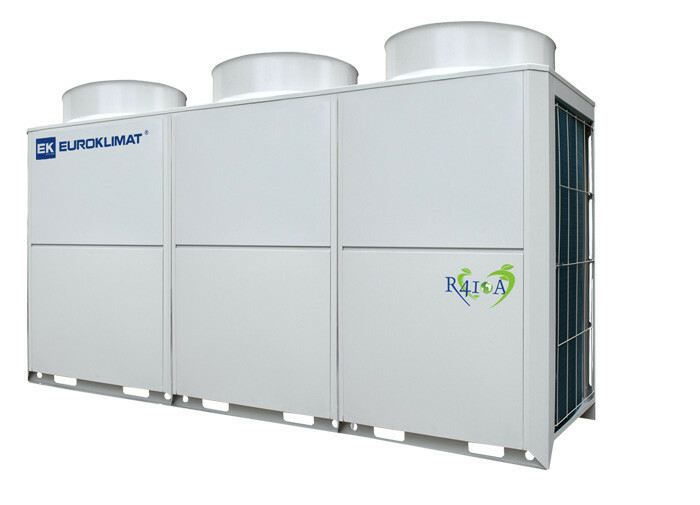 The unit boasts an outstanding IPLV(C) (refrigerating coefficient of performance). The full series of units features an IPLV(C) that is far higher than national standard energy efficiency level 1. EKRV series DC Inverter multi-connected central air conditioners can run in full load within a short period, quickly meeting indoor requirements. Enlarges the condenser of the outdoor unit to implement level-1 supercooling, and then uses an efficient supercooler to implement level-2 supercooling, reaching a total supercooling degree of 19.6°C. Enhances the cooling capability of the unit and improves the efficiency of the unit. Reduces the pressure loss when the refrigerant is circulated in the pipe, rationally allocating the ultra-long accessory pipe and refrigerant. Without a transducer, EKRV series DC Inverter multi-connected central air-conditioning units do not generate high-order harmonic and electromagnetic radiation, providing customers with healthy living and working environment. Fans of outdoor units can be regulated at 32 levels based on load changes, improving efficiency and reducing noise. The unit can safely run under light load for a long time. EKRV series digital multi-connected central air-conditioning units can generate cooling result in hot weather with a temperature of 50°C. The system can provide an external static pressure of 50 Pa, ensuring the heat dissipation result of the outdoor unit under the same installation conditions (optional). The unit uses an electronic expansion valve with 4000-step capacity regulation to increase the precision of superheat degree control (liquid level control), enhance the operation security, and improve energy saving. One set of EKRV centralized monitoring software can control up to 2048 indoor units, meeting customers' requirements for large-scale centralized management. The unit can fairly and rationally divide the electricity quantity based on the model, operation mode, operation time, air supply/ return efficiency, and refrigerant flow of the air conditioning unit to protect the rights and interests of all owners. The unit provides customers with functions such as owner management, price and recharge management, energy saving management. Models of indoor units are diverse for selection. Indoor units cover 6 series and 63 capacity types, and total fresh air indoor units are available, fully meeting customer requirements. factories, school supermarkets and so on. Supercooling Technologies: reaching a total supercooling degree of 19.6°C.